New Delhi, September 19: In a bid to bring a massive boost in the armoury of security forces and meet their immediate requirement, Defence Ministry on Tuesday accorded approval for the for the procurement of equipment valued at over Rs 9,100 crores. 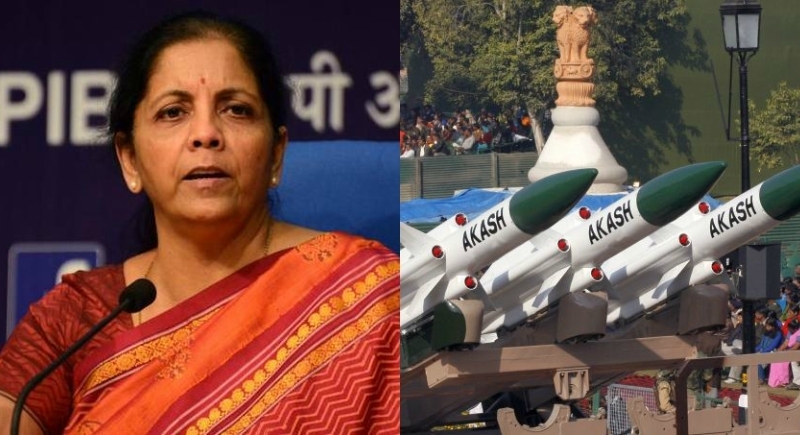 Notably, the Defence Acquisition Council (DAC), chaired by Raksha Mantri Nirmala Sitharaman accorded approval for the procurement of equipment for the defence forces valued at over Rs 9,100 crores in New Delhi. Pursuing the goal of indigenization and self-reliance, the DAC approved procurement of two Regiments of Akash Missile Systems under 'Buy (Indian)' category from M/s BDL. The Missile to be procured is an upgraded version of the previously inducted Akash missiles and will include seeker technology, possess 360-degree coverage and will be of compact configuration with reduced signature. The upgraded Akash Weapon System is operationally critical equipment which will provide protection to vital assets. The DAC also accorded approval for Design and Development of Test Equipment for Guided Weapons System of T 90 Tank. The equipment is being developed by DRDO and will give an indigenous solution to the Test Equipment used for checking the Guided Weapon System of Tank T 90. The equipment earlier procured from foreign OEMs, has been developed indigenously and is in pursuit of the Government’s 'Make in India' initiative.